The excavation at the Wasden site started in 1965 by the Upper Snake River Prehistoric Society (USRPS) under the direction of B. Robert Butler of the Idaho State College Museum, now the Idaho Museum of Natural History (Butler 1968b). The Wasden site proper consists of three proximal caves created by collapsed lava tubes. In the published literature "Wasden" is used interchangeably with Owl Cave to discuss the work done there. Of the three caves, Owl Cave (10BV30), Coyote Cave (10BV31), and Dry Cat Cave(10BV32), only Owl Cave has been extensively excavated. 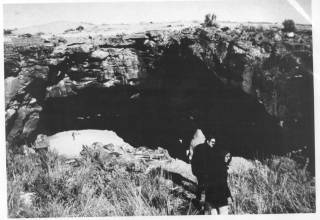 Coyote Cave received preliminary work, but because of heavy rock fall was never fully excavated. Dry cat cave received only initial testing. 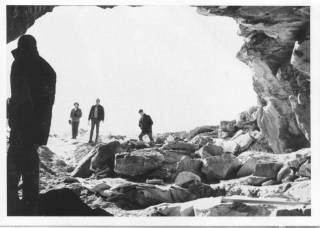 Starting late in 1965 work at Wasden consisted of limited pedestrian survey of the landscape surrounding Owl, Coyote, and Dry Cat caves. The amateur USRPS was the principal labor for the project, and as such most of the work could only occur on the weekends. Test excavations in Owl Cave were also started late in 1965. The excavations were carried out by the USRPS until 1971. Excavations were taken up by Idaho State University in 1974 under Susanne Miller. This work was the focus of a National Science Foundation grant (SOC75-10340) that was awarded to Earl Swanson, director of the Idaho State University Museum (now the Idaho Museum of Natural History). Later the analysis of the Wasden material continued with the funding of a further NSF grant (SOC77-16157), awarded to Wakefield Dort and Susanne Miller. The excavations of the site were continued in 1975, until 1977, under Susanne Miller and carried out by an Idaho State University field school with members of the Upper Snake River Prehistoric Society. Figure 5. Owl Cave opening looking into the cave. Figure 6. Owl Cave opening looking out of the cave. Owl cave consists of sporadic human occupations, however these sporadic occupations seem to consist of unique, discrete events that allow for greater understanding of prehistoric hunter-gather ecology. The events that received attention from early excavators were a dense bison bone bed, having over 6000 faunal elements, which has been roughly bracketed by radiocarbon dates between 7800 and 8200 BP (Butler 1968a, 1968b, 1971a, 1971b, 1974, 1975, 1978, 1986). Secondly, a mammoth kill, with a fluted point association, described as a workshop with extensively broken and modified bones from mammoth, bison, and camel (Miller 1982,1989; Butler 1986). Because of lack of funding or time, or perhaps because of the cultural-historical bent of the archaeology of the time, the artifacts were bagged and no analyses were carried out. Artifacts received cursory examination and were placed in a cultural-historical sequence for the two published layers. Of the two published occupations at Owl Cave there are very limited artifactual assemblages. The Bison bone bed had 62 artifacts, including flakes, organic material, projectile points, and worked bone. Butler (1968b:12) describes most of the projectile points being similar Agate Basin points (c.f. Sharrock 1966:52), which are included in the Plano series (Lohse 1995:20-21). The mammoth kill layer has a fluted point association. These points, based on the time of the occupation, are assumed to be folsom (Miller 1982). However of the approximately 1600 artifacts recovered from Owl Cave, nearly the entire culture-historical sequence from Idaho has been found. The material culture of the past has specific biographies to be explored to tell us more about the past, or more accurately the specific way in which particular things were used in the past (Kopytoff 1986). Figure 7. 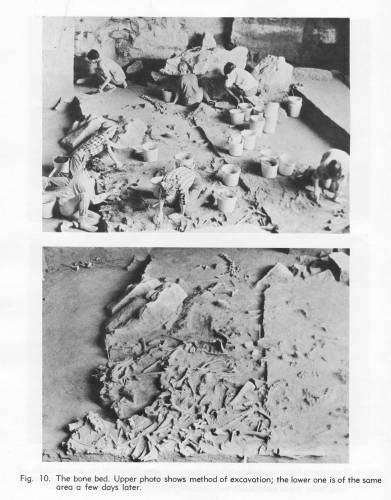 Excavation of layer 17, "the Bison Bone Bed", from Butler 1968b, figure 10.